Connecting Simple Inked to your Stripe account. 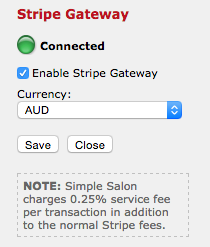 Simple Inked allows you to take payments online and directly via the Simple Inked POS page using Stripe. When you connect your Simple Inked account with your Stripe account, you can take payments for online bookings via your Online Booking site, as well as take credit card payments directly from your computer, device or smartphone. Your POS just became even more seamless and mobile. When you connect your Simple Inked account with your Stripe account you can start taking payments straight away, you don't need a Merchant Account from the bank. To get connected to Stripe you'll first need to set up your Stripe account. 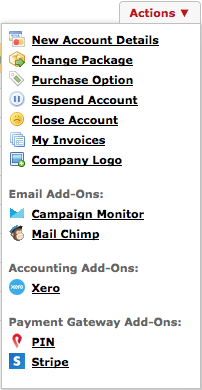 Go to your Account page and in the Actions menu click Stripe. On the right side panel click the Sign Up link to sign up for your Stripe account. Once redirected to the Stripe Sign Up, fill out the required fields and follow the prompts to created your Stripe account. Once you have filled out all relevant details, click the Authorise access to this account button. Your Simple Inked account will now be connected to your Stripe account and you're nearly ready to start taking payments. Next, in your Simple Inked account, you'll need to go to Settings, then into Cash Register Settings. 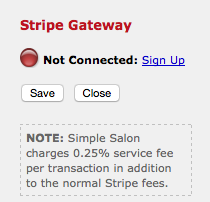 Scroll down and select the Stripe option for the Payment Gateway for Credit Cards: drop down menu. You're ready to start using Stripe. Check out the following articles to start taking payments for your POS page, and for online bookings.